Sometime in October I decided to make this year’s gift guide consist entirely of books. Probably because I’ve read some real stunners this year. Probably also because I’ve been into this idea of starting a cookbook review website where none of the books featured are new releases. (Because, apart from The Believer, I'm not sure anyone else does this with regularity.) My next thought was to get my friend Kara involved because I love reading about her epic reading life over on her blog. So, without further ado, here is your 2016 Bon Appé-Sut Nam all-book gift guide. I feel silly recommending this book, because it feels like recommending the dictionary. Anyone who has ever expressed the most passing interest in writing might already own this book. Still. Lamott is so funny and dry-witted and her advice to writers is so generous and gentle, it could steer the most panicked writer from the ledge and have her typing sentences by noon. Another love song to writing, this book tracks the friendship of Patchett with Lucy Grealy, late author of Autobiography of a Face, from their days rooming together at the Iowa Writer’s Workshop to the heartbreaking turns their adult lives take. Its pages feel like giddy summer camp days, promising first dates, and the most tender elegy all at once. The title of Astonish Me lives up to its word. I read it a few years ago, having once stumbled on Shipstead’s first novel Seating Arrangements, which I greatly admired. Prepared to be disappointed or worse, annoyed by the subject of ballet, I was once again gripped by Shipstead’s prose, evocative characterizations, and flawless scenes, and haven’t stopped thinking about the book’s ending since I finished it. I fell in love with Lauren Groff when her story “L. DeBard and Aliette” was published in Best New American Voices, and have basically read everything she’s put out since. Fates and Furies takes Groff’s ability to land on an image and flex her florid writing to new levels. It is cunning, and crafty, but most importantly, crammed full of beauty in every line. Dave Holmes almost won MTV’s first Wanna Be a VJ contest in 1998 and went on to host a number of sweet shows on MTV but because I live under a rock, I had no idea who Dave Holmes was before I picked up his book. I can’t even remember how I found this hilarious memoir, which details growing up gay in suburban St. Louis, MO, going to college at a preppy, conservative school, and stumbling into a promising career despite many steps in the wrong direction, but I’m so glad I did. It’s layered with side-splitting insights into pop culture and does the magic trick of taking the reader through Holmes’ growing ability to see and love himself, all while making you laugh your face off and nod in recognition at the painful, memorable stages of growing up. At the end of this summer I was at the library picking up another book when I saw this one on the shelf and decided to grab it too. I remembered it coming out in 2011 with great fanfare and had since noted Adler’s writing several times as it popped up in Vogue and The New York Times. My initial response was mixed. I found the writing a little too romantic and the recipe ideas introduced in a way that presented them as practical but when you got down to it, required those ingredients that elude me most: time and space—both physical and mental. For example, I can see how Adler believes that buying whole heads of lettuce and then washing and drying them is simpler, but I know that if I followed suit, we might never actually eat (clean, dry, chopped) lettuce again. Even still, there was definitely something there. I read on. To put it simply, this book is inspiring. And not just in terms of food. Adler’s precise sentences and decisive, commanding point of view inspire. She has reminded me that domesticity doesn’t have to be docile. It can be ingenious. It’s reminded me of the kind of domesticity I used to practice more of before children and the kind I hope to practice again someday soon: throwing dinner parties, planning over-the-top menus, and baking cakes at a moment’s notice. I’ve since bought myself a copy, but if you’re reading this and know me and want to get me a gift, you could opt for a delicious olive oil. Adler mentions good olive oil so frequently that you almost wish you had a room-temp glass of it nearby, just to sip on, as you turn the pages. This cookbook makes Indian cooking both enchanting and accessible. It also allowed me to approach dinner with a sense of adventure and curiosity instead of a sense of: When will the chores stop? It makes me laugh now—in terms of idioms and Spice Girls’ songs—that in order to see outside of my own particular brand of domestic resentment, I literally needed to spice up my life. True story: back in 2012, Kara and her husband visited us here in L.A. and Kara left with our paperback copy of this book. (Neither Matt nor I had read it.) Kara mailed it back, after having read it. And some four years later, I finally opened it up, thinking I might read a few pages. Well, I’d soon read the whole thing, most of it with pen in hand, underlining sentence after sentence. It’s such a beautiful book about books and reading and writing. If you haven’t read it, get a copy for yourself or, since this is a gift guide: get a copy for a good friend who might be willing to share. This book combined with Old School (as both take place at boarding schools) would make for a sweet holiday fun pack. Prep came out in 2005 and there was something I so appreciated about its pacing—kind of slow and wandery—which I feel like you don’t get as much of in today’s must-advance-the-plot! storytelling culture. Sittenfield also manages to capture so many of the complicated truths of high-school life and that weird but strong compulsion to fit in somewhere, anywhere. I got this book for Teddy on a whim and mostly out of love for its forebear, Waldo, but when we were in Pittsburgh in August, we visited the Andy Warhol museum and I got so inspired by Warhol’s life and art that I came back home newly invested in this book, which really is for all ages. Teddy likes finding Warhol and I like learning about him and his contemporaries. One of the scenes takes place at Studio 54—one of Andy’s favorite hangout spots—where the club owner, Steve Rubell once “gave Warhol a trash can full of money” for his birthday. “Warhol said it was the best present he’d ever received.” Point being, if none of these books sound like good gift ideas, you could always go with a trash can full of money. These seem like good books to enjoy! 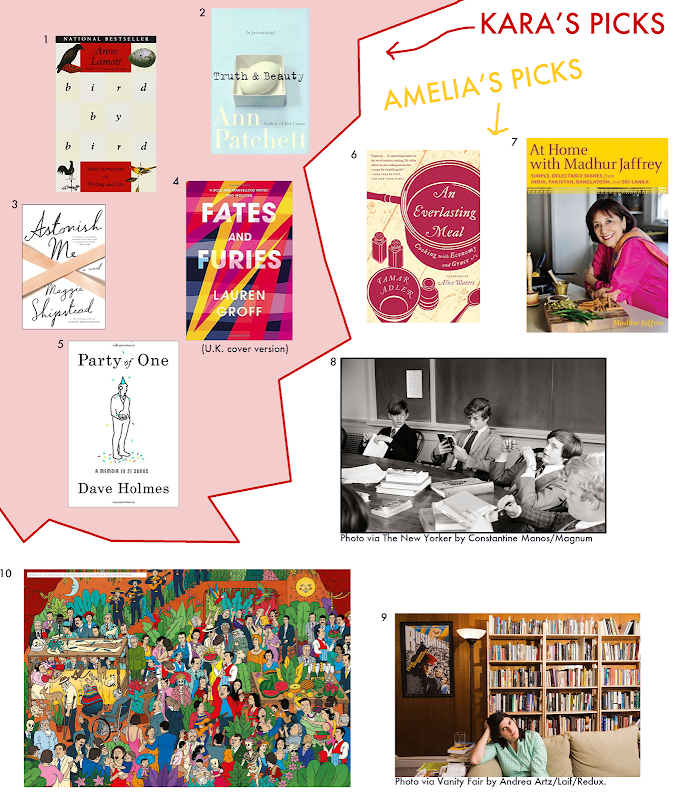 Love an all-books gift guide. Glad you liked the Tamar Adler. It's one of my favorites, but not really for cooking. As for the cookbook review site, do it!!! Have you ever looked at Tipsy Baker? She's a brilliant writer and she reviews cookbooks by cooking extensively out of each one, often to the chagrin of her husband and children. Hilarious stuff. I highly recommend reading the archives from the beginning. PLEASE start the cookbook review site! The world needs it! Have made Tamar Adler's simmered chick peas w/ olive oil more times that I can count since reading her book this fall!